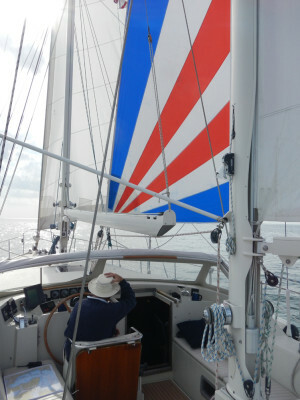 Welcome to our sailing blog and the story of our cruising adventure. Hold on to your hat. Here we go! We are sailing an Amel 53 and this is our story of how we got here, what we are doing and where we are going. We plan to update our site as our adventure unfolds with pictures and regular postings. Cindy has always been a bit of a history buff so no doubt she will uncover the hidden treasures of places we visit. Mark is an avid photographer and is excited about the photo opps ahead. We both love to cook and entertain so don’t be surprised if we post a recipe once in a while. This is not a technical sailing site by any means. In fact, we are on the complete opposite end of that spectrum. On our boat, it has a back, front, left and right. We try hard not to use confusing sailing jargon. The ambition with our site is to make it interesting and appealing for the adventurous spirit lying within all of us. As you browse through our site, please be sure to read the About Mark and About Cindy pages. This will give you a sense of who we are and what we are about. We have a strong desire to see the world meet the people and have some fun. We worked hard, sacrificed, and sold our souls to reach this point in our lives. Somehow, we made it though unscathed and somewhat sane. Many may disagree with the sanity part. We can’t really argue with them. After all, do sane people really chuck it all and sail off over the horizon? We like to think so. Specific information about Cream Puff, inside pictures and why we picked an Amel sailboat is available on The Boat tab. If you are new to our site, please read some of the older post. This will quickly bring you up to date. We will try to keep everything organized and user friendly. If you really have a lot of time on your hands and would like to read this blog from the beginning, click here. SUBSCRIBE BY E-MAIL is the best way to stay current. To get an e-mail whenever our blog page is updated, enter your email address in the RSS Feed box (this page – at the bottom) and click the “Subscribe” button. We do not share your e-mail address with anyone for any reason, ever! The e-mail will contain the latest posting and pictures so you can avoid the hassle of having to keep coming to the site. Please feel free to contact us on the Comments tab above (this is the only page where comments can be posted). If you like our site, tell your friends, family and the person reading over your shoulder (made you look). Help us spread the word of our travels so others can enjoy. If you don’t like our site, oh well ~ we tried. You can find a list of other sailing blogs we have enjoyed by clicking here. Enjoy the story of our adventure as it unfolds and morphs into whatever it may. Hello world! Here we come…..